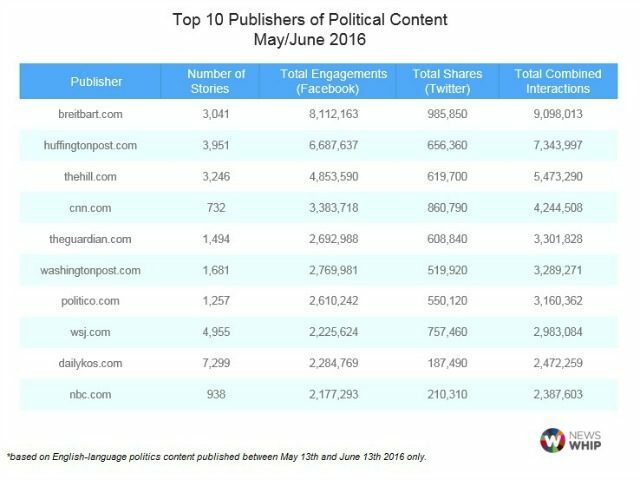 Breitbart News was the biggest publisher of political content for the months of May and June, with a lead of nearly 2 million more interactions than the second place Huffington Post. The site came out on top in research conducted by NewsWhip. Besting the competition on a list that also includes CNN, The Hill, and The Guardian, Breitbart News had a total combined 9,098,o13 Twitter and Facebook interactions, of which 89% came from Facebook and 11% from Twitter. Failing to make the top 10 list were outlets such as The New York Times and Fox News, although they do attract greater interaction per story than that of other news sites. Breitbart has been leading the way in breaking news, opinion, and analysis of not just the build up to the 2016 presidential election, but of news around the world, with teams operating across America, the United Kingdom, and Israel. Previous research undertaken by NewsWhip has shown that conservative news tends to perform better on social media than anything else, despite attempts from Facebook to suppress conservative voices in favour of liberal outlets, whilst Twitter continues to refuse to verify Breitbart’s official Twitter account and has suspended Breitbart News’ Milo Yiannopoulos’ account twice in the past 48 hours without explanation. Breitbart News would like to thank all its readers for their continued interest and support.